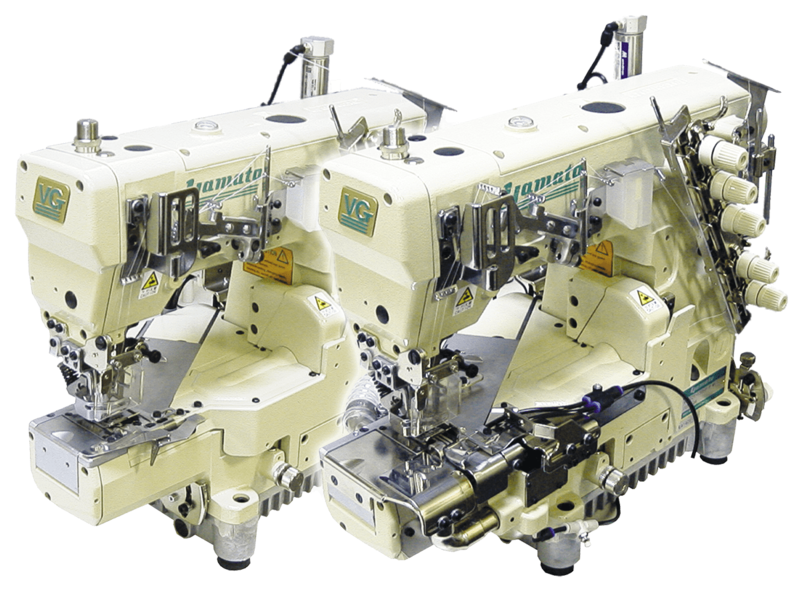 VG-8 series :: Super High Speed Multi Module Cylinder Bed Interlock Stitch Machine with Active Thread Control - Interlock (Flatlock/Coverstitch) | Products | Yamato Sewing Machine Mfg. Co., Ltd. Being the Best Solution for Variety of Difficult Sewing Conditions, VG-8 series Ensures High Quality & High Investment Efficiency with Yamato's Signature Active Thread Control and Epoch-Making Multi Module Design. Yamato's signature Active Thread Control supports ideal seam over wide range from soft and elastic seams for microfibers to tight seams for outer wears. Various optional modules contribute to high quality, quick delivery and cost-saving are available. Yamato "Non-stain" Technology for minimizing the risk of oil stain, the most frequent cause of defects. Active Thread Control supports ideal seam over wide range from soft and elastic seams for microfibers to tight seams for outer wears. Yamato "Non-stain" Technology minimizes the risk of oil stain, the most frequent cause of defects. If you are looking at further flexibility for the recent frequent and big change in sewing condition, Yamato's signature "Active Thread Control" is the right technology. Active Thread Control performs epoch-making soft and elastic seams suitable for garments with lightweight, soft and stretchable microfibers, such as athletic wears or ladies' intimates. 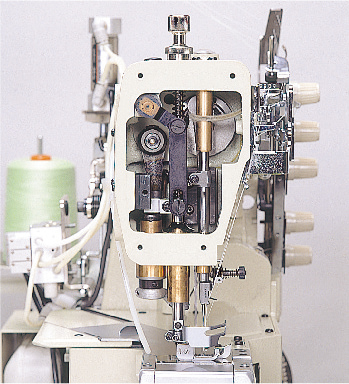 Unlike the conventional way of thread control, which mainly use tension (resistance) on each thread, Yamato "Active Thread Control" takes in and draws back thread when it is required, and well-balanced seams with minimum necessary tension(resistance) for thread regulation. The soft and elastic seams made with Active Thread Control offer the tunnel free finish preventing seam breakage. High streatch seaming prevents seam breakage. Making ideal seams over wide range, Active Thread Control supports wide variety seams from soft and elastic seams to tight seams. Yamato Active Thread Control makes ideal thread balance control to form any desiered seam, with less stress given to each thread. 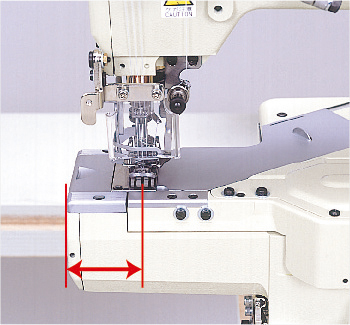 Adjustment from soft to tight seam can be done simply and visibly, addressing frequent changes of sewing conditions. 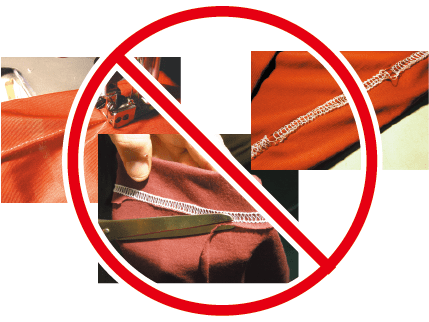 Wide variety of seams can be performed with Active Thread Control, by the simple and "visible" adjustment, not by the "fuzzy" adjustment tension devices. 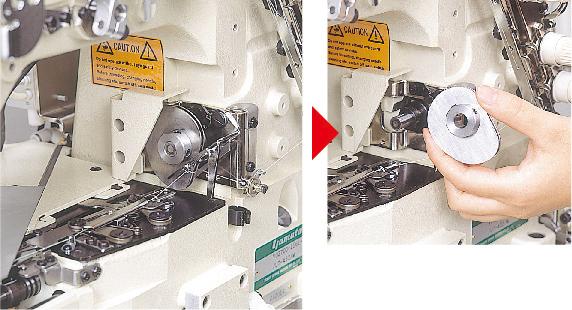 Adjustment from soft to tight seam can be done simply and visibly to minimize required skills and downtime spent for addressing frequent changes of sewing conditions. No moving parts on top of machine head. The new needle thread take-up system eliminated needle bar thread take-up while improving its performance to obtain neat stitch formation. This feature satisfies various safety standards. Yamato's "Non-stain" technology will not sacrifice the performance and the durability of machines, but keep the machine running smoothly at high speed for long life. 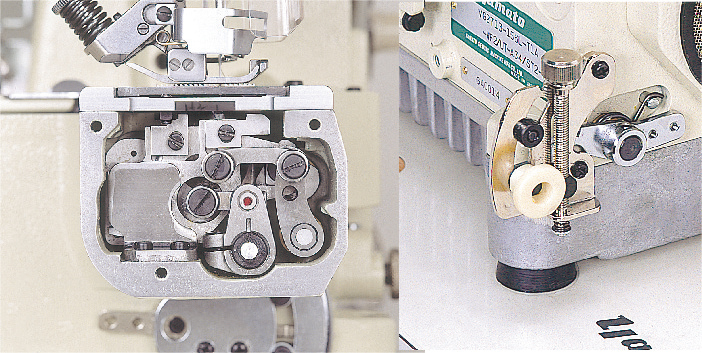 While giving enough lubrication for the internal driving mechanism, Yamato exclusive sealing sytem prevents the oil from coming to the sewing area through moving parts. 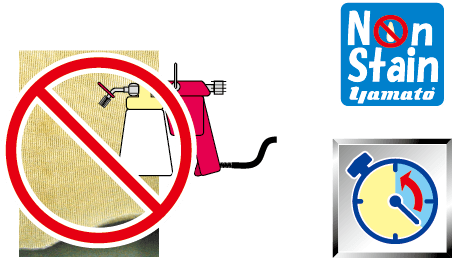 This feature minimizes the risk of oil stain, one of the most frequent cause of defects. Non-stain finish minimizes your loss, such as downtime and extra cost caused by spot removing operations. There is no need to worry about oil leakage from the upper needle bar as it securely sealed. Multi-module design of Yamato VG series enhances agility for multiple applications. One machine can be ready to be converted into left hand fabric trimmer type, standard type and right hand fabric trimmer type. Micro Adjuster is introduced for easy and precise control of stitch length and differential ratio. Besides, once you set the differential ratio, the ratio stays the same even if you change stitch length, as main and differential feed are linked. 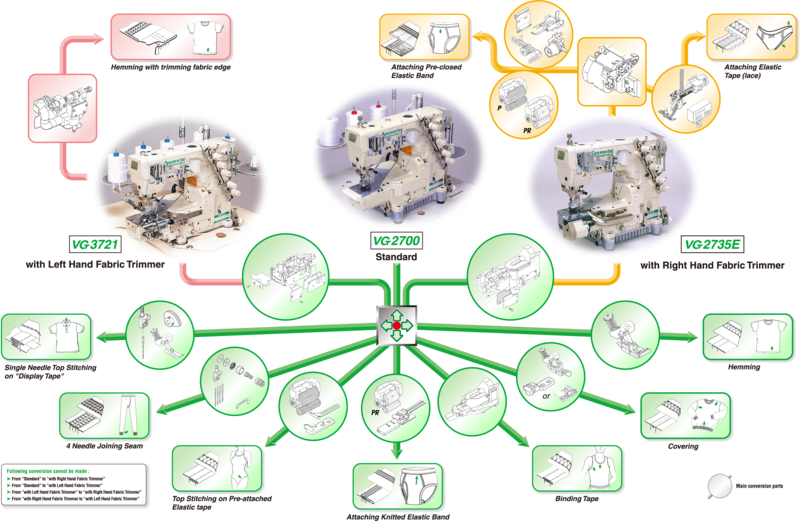 Also, durability of feed mechanism is improved as "Linear Differential Feeding System" is introduced. Needle bar stroke can be switched from 31 mm (standard) to 33 mm by simply turning an eccentric pin on the needle bar. This epoch-making system shortens the downtime for conversion to meet extreme change of fabric weight. From needle drop point to the left end of cylinder bed is only 45 mm, 30 mm shorter than conventional models. 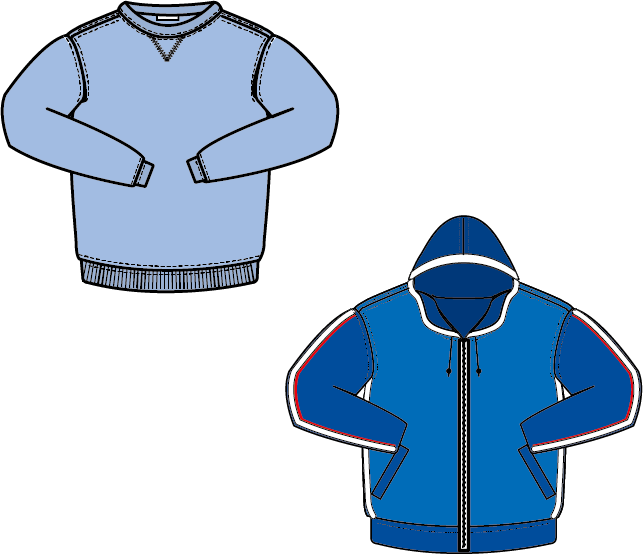 Operators can handle the fabric easily without obstructions especially when the machine is used for covering and top stitching and other similar operations. Extension Cover is available when sewing small parts such as sleeves of T-shirt and etc. The cam is located outside of the machine frame for easy adjustment and removal. Downtime to unwind looper thread in case of it winds itself around the cam is dramatically shortened. Also the cam can be exchanged easily accourding to different sewing conditions. 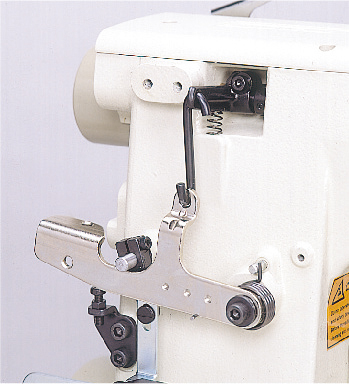 The outer lever (similar to the one for overlock machine) enables easy assembled and adjustment of foot lifter without removing top cover.